Family photo shoots in Edinburgh - superhero consultations a must! Family photo shoots in Edinburgh need superhero consultations! Family photo shoots in Edinburgh can sometimes involve me understanding the commercial relations between superheroes. I was on the back foot as soon as I got the characters on his pyjamas wrong. “No, no, Batman’s not on my pyjamas!” the 8 year old said to me, with the confidence and self-possession of a multi-national CEO. “It’s Marvel. YOU know. The superheroes? Iron Man”? This lad knew what he was talking about. Iron Man, Batman, Superman, Spiderman … I thought they were all the same! Catching baddies and zooming about saving the universe in their underpants?! I had no idea there were different “camps” of superheroes and clearly had to be educated. The pyjamed superhero in front of me soon put me right, and I listened carefully to why Batman and Superman’s paths don’t generally cross. We had a great chat about it! Well actually it wasn’t so much of a chat as me grasping how these things really matter to 8 year olds. His mum had contacted me as she wanted to give my superhero’s Grandpa a family portrait of his three grandchildren for Christmas. What a unique and thoughtful idea for a present! The winner for Grandpa’s wall! As it’s vital to me that I meet my clients before a photography session to find out about them and give them photographs they will truly love, I popped round to her house for a visit a couple of weeks before our photography session was scheduled. I LOVE these consultation sessions! She told me that she particularly wanted a lovely photograph of Superhero and his two cousins for Grandpa’s wall, and that capturing the individual personalities of the children and having their faces shown clearly was very important. Now in order to be able to do this, I knew I’d have to spend some time asking lots of questions about the children – what they’re like, what they’re into, what they like doing, and what their natures are like. I COULD have just turned up and photographed them, but without a really good chat about it all beforehand, I’d be flying by the seat of my pants. Where photographing my clients is concerned, I simply won’t do that. 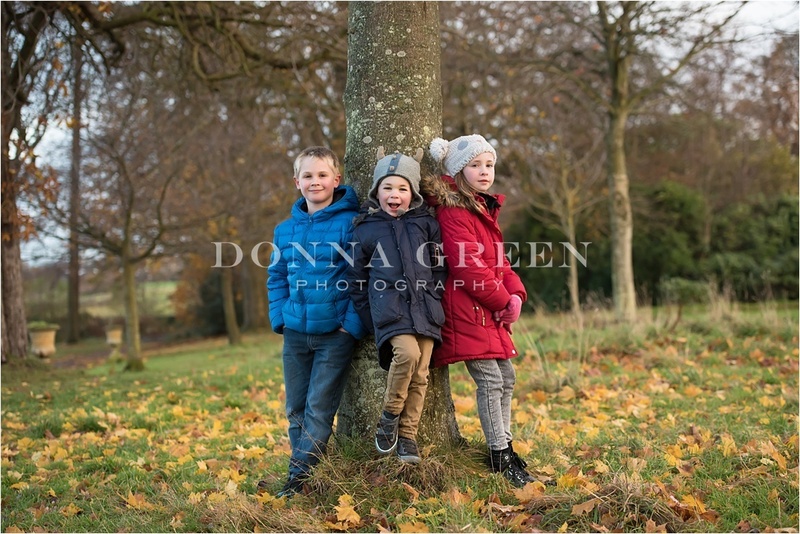 Climbing tree, jumping in puddles, running about … Much more fun than posing under studio lights! What kind of photographs would YOU like? If they’re not exactly sure what they want from their photography session, we chat about their options. Now, I’m primarily an outdoors, natural light, photographer so that much is pretty much a given, but does she want images of the whole family together? Just one child? Or more? Are the most important pictures to her the ones of the children screaming with laughter, tearing around, climbing trees and doing cartwheels, taking in the whole environment? Or would she prefer more thoughtful close-up studies of a quiet moment? What combinations of family members does she want most of all? Photographs of everyone facing the camera and connecting with me, or looking at and connecting with each other? In any one session I capture all of these things and more, but if there is one particular “hero image” my client particularly wants, one which she wants in the form of a large wall portrait, it really helps me to know that so I can prioritise capturing it. I like to know the personalities of the people involved too, so I can give my clients images which really capture what that person is all about. I knew from meeting Superhero that here was a confident, lively, sparky wee boy whom I could really see running about, jumping, tree climbing, and generally larking around. Then from a good chat with his mum, I formed the impression that his girl cousin, a couple of years older than him, was a wee bit more sedate, quieter, and more reserved, and that her wee brother was lively and liked jumping about with his big Superhero cousin. That most definitely informs the way you deal with children when you’re photographing them and is so important to know in advance. I knew right away what I’d be doing with these three, and was so looking forward to it! But we still had to discuss clothing – face it, clothing can make or break your portraits. I had already given Superhero’s mum my “best clothing for photographs” guide and was delighted that she’d already picked out what her boy was going to wear. Sometimes clients show me at these consultation sessions what they have in mind, or sometimes they just send me through phone snaps of ideas they’ve got and we talk about what would work best. Top tip for deciding on clothing! A top tip for deciding what you’ll wear for your family photo shoot is to lay things out on your bed, take a few steps back, and consider everything as a whole. I have a Pinterest board here for clothing inspiration, in addition to the clothing advice I give all my clients when they book with me – don’t worry, you’re not left on your own to come up with what’s best to wear! So that’s why a pre-session consultation is something I absolutely insist on, every single time I take on a new client. I spend a lot of time with my clients – they matter to me, and I like to give the very best experience I can to each one. Our photography sessions are all highly personalised, and this face-to-face discussion benefits both me and them. I’ll be the first one to admit I don’t always get it right though, and I always want to learn how to make the experience better and better. The next time I meet a laddie who’s into superheroes, I’ll be so much more prepared! Tell me, what do I need to brush up on to chat to YOUR little superheroes?